Spring is officially here and I'm feeling it. I spent the weekend cleaning. Reorganizing the Humble pantry, finding rogue splatters of macaron batter in the kitchen and attempting to remove it without the aid of a chisel. I'm also craving warmer weather desserts, like yummy ice cream floats. Of course, since buying a new ice cream maker, I now have plenty of ice cream around that needs a use. 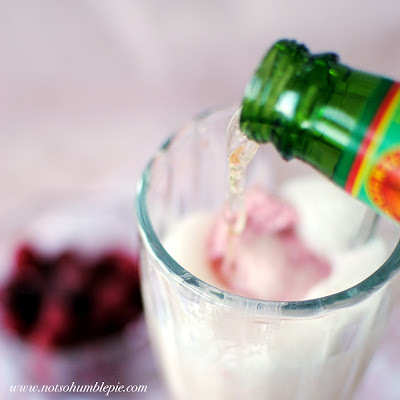 Today's Raspberry Ginger Ice Cream Float is Mr. Humble's favorite (that man loves ginger), creating a frosty drink that is creamy, spicy and tart. Sounds interesting, right? It is and it is good. This is my easiest ice cream base, a simple mix of fruit, milk, cream and sugar that never lets me down. It requires no cooking, uses no eggs and is ready to churn in less than 5 minutes. For the non-ginger lovers, you're welcome to omit the candied ginger. Just substitute a teaspoon of vanilla extract for an equally delicious, creamy raspberry ice cream (Try topping it with a cream soda for an amazing float). Toss the raspberries into your food processor and blend until pebbly. Add the sugar and the milk and mix until a slurry forms. (You can strain this mixture if you want a smoother ice cream, however I actually like having the seeds in there.) Add the heavy cream and then blend for a little under 10 seconds. This beats a little air into the ice cream and results in a smooth, creamy and easier to scoop ice cream. If you're working with frozen berries and chilled ingredients, the mixture is ready to be added to your ice cream maker now. If you substituted fresh berries, chill the mixture in the refrigerator for roughly 30 minutes before churning. Add the mixture to your ice cream maker and follow the manufacturer's instructions. During the last few minutes of churning, add the finely chopped ginger. Pour the finished mixture into a container and chill for at least an hour, until firm. This picture brings out my inner girlie-girl. I love this color. Does making a float require instructions? Well for those in need of directions: take a couple scoops of the ice cream and top with ginger ale or ginger beer (these are non-alcoholic beverages, mind you). Pour slowly as it will foam up. Serve it up in a tall glass with an old fashioned spoon-straw and you've got that ice cream parlor experience right at home. For an even prettier presentation, toss a couple fresh/frozen raspberries into the bottom of the glass before adding the ice cream. I just got an ice cream maker and I think I will need to try this recipe out pronto! Thanks for posting the recipe! Oh how I wish I had the space in my tiny apartment kitchen for another appliance!! I SOOOO want an ice cream maker now! What kind of maker did you get and I assume you like it? I've been so frustrated in the past with ice cream makers. Wahey! No eggs! :D Thanks Ms. Humble! I've used Cuisinart ice cream makers for years and am quite satisfied with the results. This is the model I've used for almost a decade: Cuisinart 1-1/2-Quart Ice Cream Maker (until I lost the base in a move). I recently bought a Cuisinart 2-quart ice cream maker but found it was louder, took up too much space. I decided to exchange it for the smaller, and less expensive model above. Besides, I still had the bowl for the old model (now I have a total of three). The only down side of this type of ice cream maker is that you have to freeze the bowl for at least 24 hours before making the ice cream. Having a lot of bowls to rotate through means I can make several flavors in a single day. What a lovely float. The ice cream looks amazing. I think I'm about ready to get out my ice cream maker, too, and your recipe sounds really good. I recently tried a lemon ginger ice cream that was amazing. I can haz come live with you? I have never seen 40% cream anywhere before...the highest I've ever seen is 35% whipping cream. Is this a Canada vs. USA phenomenon? That ice cream has a gorgeous color and pairing it with ginger ale sounds like a real good idea. Oh man that looks good! Makes me want to dig out the freezer portion of my manual ice cream maker! I am so going to try this ice cream!! I love raspberries and ginger, and have an ice cream maker at home, so there's no reason for waiting much longer. Plus the colour is truly amazing!!! Not so much a Can vs U.S. thing as a retail vs commercial thing. In the U.S. 40% minimum milk fat cream can be found at the big warehouse stores (like Costco, where I get it) and restaurant supply stores. It generally isn't available at regular U.S. grocery stores but it is widely used for commercial cooking. In other countries 40%+ milk fat creams are called heavy cream, extra heavy cream or double cream. I list the milk fat of what I use so there is no confusion as to what type of cream I use on the blog. If you're not able to find 40%+ cream, just substitute a cream with the highest percentage of fat you have available. Oh, I LOVE ginger ice cream floats and this one looks exceptionally good. And Reed's ginger beer is definitely the way to go. On another note, I adore your blog: the food, photography, and creativity are exceptional. Sounds great and looks so pretty! One of the general rules when making ice cream is that anything remotely chunky should be added in the last few minutes of churning. This prevents the larger bits from gumming up the paddle and then freezing into a clumpy mass. I'll clarify that in the post. Thanks! I really like the cream and combine it with another kind of ingredients. It drives me crazy, and i love to spend time with my friends and i like to prepare some cakes with too much cream. Hey! Where's My Swan Neck Pudding, Wench? Top 10 Most Difficult Dishes To Make?